The Fritz!Box is a router with build in VOIP and DECT functionality. With this plugin you can trigger scenes on incoming calls, outgoing calls, connect and hang-up. You can use it to send notifications, turn off music or if you're bold announce who is calling in your speakers. You need to open the TCP-Port 1012 on your FRITZ!Box to use the plugin. For opening the port call #96*5* on your phone. If you want to close the port again you can call #96*4*, but then the plugin won't work anymore. Download the four files found under "Browse Source">trunk above. Add the four files using "Browse"-button. Click "Restart Luup after upload" checkbox and press Go. Set "Upnp Device Filename" to "D_FritzBox.xml"
Set "Upnp Implementation Filename" to "I_FritzBox.xml"
v0.3 - Smaller icon (50x50). v0.1 - Initial version released. Basic functionality. fritzlog.png​ (8.4 KB) - added by hek 6 years ago. fritzbox7390.jpg​ (11.1 KB) - added by hek 6 years ago. 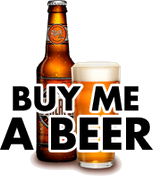 beer.png​ (26.5 KB) - added by hek 6 years ago.